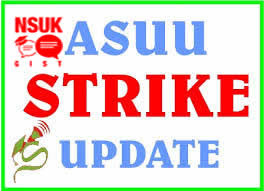 The Academic Staff Union of Universities, ASUU, Nasarawa State University chapter rose from its emergency meeting today to insist that the Union is resolved to sustain the more than 2 months industrial action to a logical conclusion. Addressing the media after the meeting, the chapter chairman Dr. Theophilous Lagi, said government has refused to call them for discussion since the last time the Union replied government’s letter over a month ago. He said government has not been serious in addressing the issues, otherwise the problem would have been over by now but the nonchalant posture of government is the only reason why the strike has reached this far. He insisted that the strike will go on despite that government has been starving the lecturers by withholding their salaries for the past 3 months. “ASUU is not being rigid as some people may think. If government invites us for discussion, I believe we can reach a common ground but when they sit and take unilateral decisions—that will not solve the problem”, he said. According to him, ASUU is ready for compromise in some of the contentious issues but said, in a situation where government refused to discuss with the Union, members have no other choice than to continue with the strike. “Their problem is that they imagine that our problem is money and since then they’ve been flying the 15 percent, with the condition that we must suspend the strike, but they are wrong. We have not been paid salaries for the last 3 months but that will not diminish our resolve”, said Dr. Lagi. He further revealed that they have been interventions from some concerned individuals and stakeholders, including students towards resolving the strike, saying, if such interventions are sustained the strike may likely end soon. The chairman read a letter from the National Secretariat of ASUU, whereby members are directed to join the nationwide strike called by the Nigeria Labour Congress, NLC, if “government up till 12 Midnight on Tuesday 17th May, 2016 fails to reverse the increase in electricity tariff and the pump price of petrol”, the letter read. Dr. Lagi also announced that Comrade Biodun Ogunyemi has been elected new president of National ASUU at the last NEC meeting held at University of Uyo, AkwaIbom state, thus taking over from Comrade Isa Fagge.